Marcy Martha May Marlene was a much-talked about movie on the festival circuit this year, so I was eager to get to see it in its St. Louis preview. Starring Elizabeth Olsen (younger sister of Mary Kate and Ashley) as the title character — all four names refer to the same person — the movie is the difficult story of a young woman’s efforts to adjust after leaving a cult. At the outset of the film, Marcy May is one of a number of young men and women living and working at an isolated farm with a charismatic father figure, Patrick (John Hawkes). While the people involved would certainly deny it, this is clearly a cult. Waking one morning before everyone else, Marcy May leaves the farm, headed for a nearby town. There she is confronted by one of the young men from the farm, but eventually calls her estranged sister to come and get her. Martha (her actual name) returns with Lucy (Sarah Paulson) to the summer cabin that Lucy shares with her husband Ted (Hugh Dancy). The sisters have been out of touch for a couple of years, and Lucy’s attempts to work through some of their issues fall short with Martha, who is reticent to discuss where she’s been and why she’s adopted some strange habits, such as skinny dipping in a public lake in broad daylight. As Ted and Lucy become more and more frustrated with Martha, she begins having flashbacks to her days on the farm, and paranoia begins set in. The present-day scenes are intercut with scenes from Martha’s time with the cult, sometimes clunkily and sometimes to great effect. 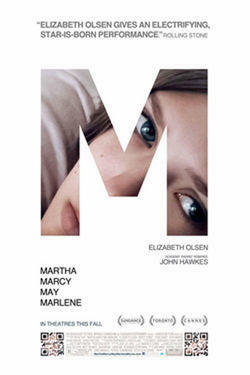 Martha Marcy May Marlene is not always an easy movie to watch. The performances are uniformly good, especially Paulson and the always-reliable Hawkes (who shined in 2009’s equally bleak Winter’s Bone). Olsen’s performance surely cemented her place within the film community, and if the movie could be expected to reach mass audiences, this would certainly be considered her breakout role. Unfortunately, the movie’s bleak, totally humorless tone and abrupt ending will prove daunting to most audiences. The camera work, by Jody Lee Lipes, deserves special mention, as it is fluid and always interesting. “A complete waste of two hours” was a comment I heard in more than one form from audience members of the screening I attended. I absolutely do not agree with that evaluation, but having seen Martha Marcy May Marlene once, I have no desire to see it again. I do, however, look forward to what Elizabeth Olsen and John Hawkes have in store next.